The Eagles Nest sauna is a unique design that will blend in with your modern home or rustic cottage. Handcrafted in Canada with Canadian western red cedar this quality kit will give you years of sauna enjoyment. The Eagles Nest sauna is a unique design that will blend in with your modern home or rustic cottage. Handcrafted in Canada with Canadian western red cedar this quality kit will give you years of sauna enjoyment. At the heart of this sauna is a SaunaCraft stainless-steel sauna heater or wood burning sauna heater that will heat up the Eagles Nest in 30 minutes or less. 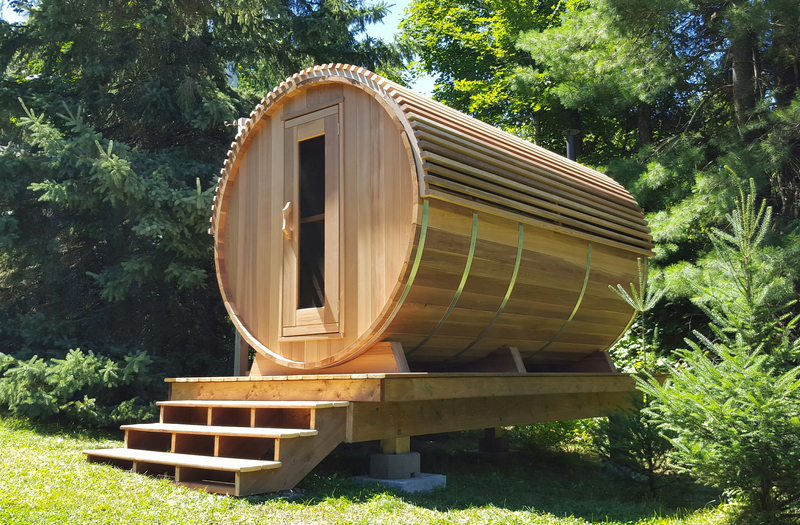 Enjoy the great outdoors all 4 seasons with this stylish sauna at your home or cottage! Solid Wood construction with full tempered glass door. 2 long benches with built in angled back rests. Harvia Wood burning inside feed heater. Outside feed wood burning sauna heater. Optional Bucket/Ladle and other sauna accessories available.